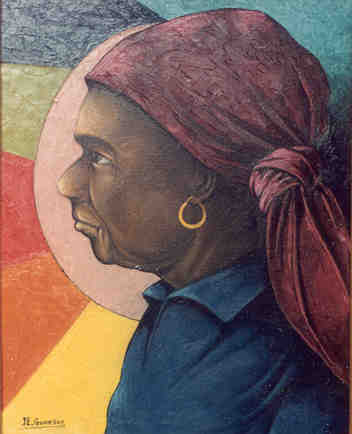 Gourgue was one of the greatest of all Haitian artists. A work he did at age 17 is in the permanent collection of New York's Museum of Modern Art. Following that, and for almost half a century, he produced a steady stream of masterpieces. When I met Gourgue, in 1985, I had with me a photograph of Grandmère (so titled on its back). 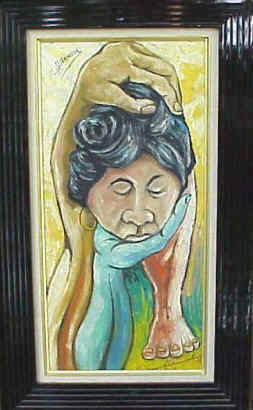 Purchased from a Petionville gallery in 1972, it was the first painting I had ever bought. He confirmed that the subject was his own grandmother. I gave him the photo; it was still taped to a wall in his studio the last time I saw him. 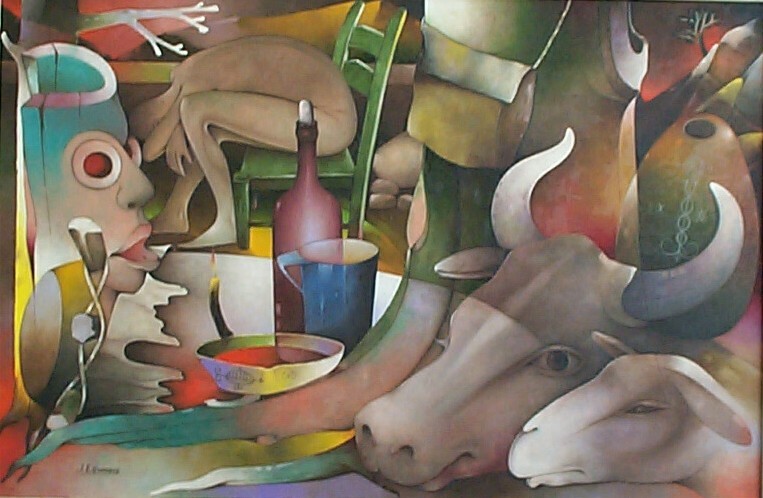 I commissioned Reposair — I asked for 'a vodou scene' — through an acquaintance in Haïti. In December 1985, when I heard it was done, I rushed to Port–au–Prince, located Gourgue's studio, and walked in alone and unannounced. Of the several works completed and in progress, I most admired Reposair. 'It's not for sale: it's for a big collector in New York,' Gourgue explained. Having moved back to California a couple of years earlier, I didn't realize he meant me. A couple of days later Gourgue built a wooden crate, packing his and other paintings in it — including one by Duffaut — for me to ship as 'excess baggage' on my flights back to San Francisco. In exchange he asked if I would bring him a cordless telephone on my next visit. I did. Not finding him in his studio, I located his comfortable, hilltop home. Ushered in by his housekeeper, I waited till he roared up in his late–model Japanese car. We then shared some wine and broken English conversation. Nature Morte was acquired in 2014 from a Florida auction house -- for about a fourth of the current asking price for Gourgues of similar size. 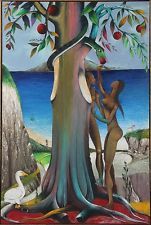 Months after Reposair, early in 1986, Gourgue would do me the great favor of negotiating with Rigaud Benoit fils and — with much difficulty — persuading that young man that I, having paid for his father's last painting, was legally and morally entitled to it. I didn't know J-E Gourgue so long or so well that I can say we were friends. But we did one another favors, bidden and unbidden. And if not friendship, it was close. Two decades after his death, I mourn him still. Jacques–Enguerrand Gourgue is not just one of my favorite artists. He was also one of my favorite people.